"A SHINING CITY UPON A HILL"
American mythology teaches that the early United States was founded by men of conscience who came to the "new world" in order to practice their religious convictions in peace and freedom. John Winthrop (1588–1649), the first governor of the Massachusetts Bay Colony, in particular has been quoted as a source of inspiration by U.S. presidents from John F. Kennedy to Ronald Reagan. Yet Winthrop did not represent a tradition of either democracy or religious tolerance. He hated democracy with a passion. 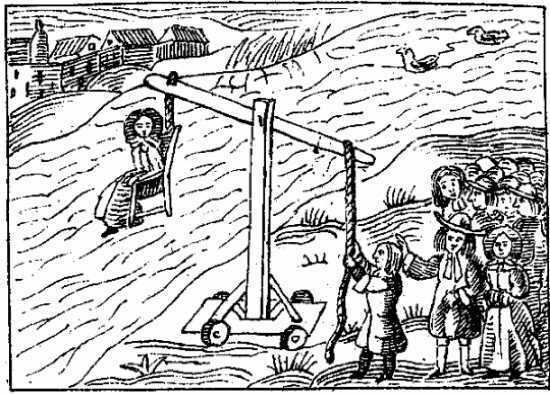 The state he created did not hesitate to execute people like the Quakers and even brought to the "new" world the very popular tradition of medieval Europe, the trial and execution of witches. The quotes from Winthrop below illustrate the troubling nature of Puritan society in Colonial America. John Winthrop's "shining" city had more in common with the various totalitarian utopias in history than with the spirit of the Bill of Rights passed more than 100 years after his death. This a useful fact to keep in mind when considering the various current proposals get "get America back the traditional values of the Puritans". Thomas Jefferson's views of the Puritan faith listed below are particularly illuminating. For more on what Jefferson had to say about Christianity and politics click here. Note: Some of the language in the quotes has been modernized for readability. This most famous of Jesus' sermons is the source of Winthrop's inspiration for his now famous "city upon a hill" statement. Source: Jesus Christ, The Sermon on the Mount, Matthew 5:14-16. "If we should change from a mixed aristocracy to mere democracy, first we should have no warrant in scripture for it: for there was no such government in Israel ... A democracy is, amongst civil nations, accounted the meanest and worst of all forms of government. [To allow it would be] a manifest breach of the 5th Commandment." Source: R.C. Winthrop, Life and Letters of John Winthrop (Boston, 1869), vol. ii, p. 430. FOUNDING A CHRISTIAN "CITY UPON A HILL"
"Now the only way to avoid this shipwreck and to provide for our posterity is to follow the Counsel of Micah, to do Justly, to love mercy, to walk humbly with our God, for this end, we must be knit together in this work as one man, we must entertain each other in brotherly Affection, we must be willing to abridge ourselves of our superfluities, for the supply of others' necessities, we must uphold a familiar Commerce together in all meekness, gentleness, patience and liberality, we must delight in each other, make others Conditions our own rejoice together, mourn together, labour, and suffer together, always having before our eyes our Commission and Community in the work, our Community as members of the same body, so shall we keep the unity of the spirit in the bond of peace, the Lord will be our God and delight to dwell among us, as his own people and will command a blessing upon us in all our ways, so that we shall see much more of his wisdom power goodness and truth then formerly we have been acquainted with, we shall find that the God of Israel is among us, when ten of us shall be able to resist a thousand of our enemies, when he shall make us a praise and glory, that men shall say of succeeding plantations: the lord make it like that of New England: for we must Consider that we shall be as a City upon a Hill, the eyes of all people are upon us; so that if we shall deal falsely with our God in this work we have undertaken and so cause him to withdraw his present help from us, we shall be made a story and a byword through the world, we shall open the mouths of enemies to speak evil of the ways of God and all professors for Gods sake; we shall shame the faces of many of gods worthy servants, and cause their prayers to be turned into Curses upon us till we be consumed out of the good land whether we are going: And to shut up this discourse with that exhortation of Moses that faithful servant of the Lord in his last farewell to Israel Deut. 30. Beloved there is now set before us life, and good, death and evil in that we are Commanded this day to love the Lord our God, and to love one another to walk in his ways and to keep his Commandments and his Ordinance, and his laws, and the Articles of our Covenant with him that we may live and be multiplied, and that the Lord our God may bless us in the land whether we go to possess it: But if our hearts shall turn away so that we will not obey, but shall be seduced and worship other Gods our pleasures, and profits, and serve them, it is propounded unto us this day, we shall surely perish out of the good Land whether we pass over this vast Sea to possess it; Therefore let us choose life, that we, and our Seed, may live; by obeying his voice, and cleaving to him, for he is our life, and our prosperity." Winthrop of course derived his notion of a "city upon a hill" from the Gospel of Matthew. Chaplain Roger Williams landed in New England in February 1631. He emigrated from Britain in search of a place where he could have the freedom of conscience to preach his Christian beliefs without fear of censure by ecclesiastical authorities, especially Archbishop William Laud and the Church of England. Williams had been an outspoken advocate for freedom of worship and this had drawn the ire of Church officials in Britain. Upon reaching the new world Williams was warmly greeted by John Winthrop and installed as a lay pastor in Salem. Within three years, however, considerable friction had arisen between Williams and the Puritan authorities. The immediate cause of the conflict was Williams' insistence that the Boston church renounce its ties to the Church of England. These ties were required by the colony's charter, meaning Williams' stance endangered the authority of the colony's Puritan rulers. Williams was willing to serve as a lay minister, but he would not formally join the Boston church. Williams also questioned the right of the King of England to have granted land to the colony, land that Williams argued was not the king's to give. Williams also opposed a "citizen's oath" of loyalty to the Puritan magistracy that was required by the Massachusetts Bay authorities. Lastly, Williams preached that it was wrong for authorities in Boston to enforce rules of worship in congregations that were not in Boston. Here once again was Williams' tendency to call for freedom of worship in opposition to established ecclesiastical authorities. To be fair, the self-righteous Williams would also not tolerate the differences of opinion held by those who opposed him. Williams' case was brought before the General Court in Boston in October 1635. By this time John Winthrop was no longer the governor of the colony. Winthrop had been a friend of Williams' and had tolerated his dissent out of concern for that friendship. The new governor, Thomas Dudley, was not sympathetic to Williams. The court ruled against Williams and he was to be deported to England, where he would be at the mercy of Bishop Laud. Therefore, Williams and his followers fled the Massachusetts Bay colony in the dead of winter (January 1636) and headed to the Narragansett Bay, where they settled the new colony of Rhode Island. Sources: Francis J. Bremer, John Winthrop: America's Forgotten Founding Father (Oxford: Oxford University Press, 2003), Roger Williams, A Brief Biography, Roger Williams Theologian. John Winthrop and his associates did not tolerate dissent from Puritan religious orthodoxy. In 1638 Winthrop presided over the trial of Anne Hutchinson, a well-spoken woman who held beliefs that diverged from those of the Massachusetts Bay Colony's religious establishment. Hutchinson particularly denied the Puritan credo that good works and faith together were necessary for personal salvation, claiming that faith alone was enough. For this belief and her insistence that divine inspiration could come directly from God and not through scripture alone, Hutchinson was branded a heretic and banished from the colony. Hutchinson and 60 of her followers left the Massachusetts colony in March 1638 and settled on Aquidneck Island on the Narragansett Bay. There they founded the city of Portsmouth. For his part, Winthrop referred to Hutchinson after the trial as an "American Jezebel" and as an agent of the devil. Sources: Francis J. Bremer, John Winthrop: America's Forgotten Founding Father (Oxford: Oxford University Press, 2003), p. 299 and Anne Marbury Hutchinson. "If any man after legal conviction shall have or worship any other god, but the lord god, he shall be put to death." "But for the natives in these parts, God hath so pursued them, as for 300 miles space the greatest part of them are swept away by smallpox which still continues among them. So as God hath thereby cleared our title to this place, those who remain in these parts, being in all not 50, have put themselves under our protection." Note: Winthrop and his contemporaries were inspired by a passage from Psalms 2:8 which stated: "Ask of me, and I shall give thee, the heathen for thine inheritance, and the uttermost parts of the earth for thy possession." His [Calvin's] religion was demonism. If ever man worshiped a false God, he did. The being described in his five points is ... a demon of malignant spirit. It would be more pardonable to believe in no God at all, than to blaspheme him by the atrocious attributes of Calvin" See more on Jefferson's views on religion by clicking here. Source: Thomas Jefferson, Works , Vol. IV, p. 363. "Standing on the tiny deck of the Arabella in 1630 off the Massachusetts coast, John Winthrop said, “We will be as a city upon a hill. The eyes of all people are upon us, so that if we deal falsely with our God in this work we have undertaken and so cause Him to withdraw His present help from us, we shall be made a story and a byword throughout the world.” Well, we have not dealt falsely with our God, even if He is temporarily suspended from the classroom. ... We are indeed, and we are today, the last best hope of man on earth." Source: Reagan speaking to the First Annual CPAC Conference, January 25, 1974. "I’ve spoken of the Shining City all my political life. … In my mind it was a tall, proud city built on rocks stronger than oceans, windswept, God-blessed, and teeming with people of all kinds living in harmony and peace; a city with free ports that hummed with commerce and creativity. And if there had to be city walls, the walls had doors and the doors were open to anyone with the will and the heart to get here. That’s how I saw it, and see it still.'" Source: Ronald Reagan Farewell Address. Cited in Amos Kiewe and Davis W. Houck, "A Shining City on a Hill. Ronald Reagan's Economic Rhetoric, 1951-1989".